This March, you can help Make-A-Wish Southern Nevada grant wishes for local kids when you participate in the 2015 Walk For Wishes. The walk takes place in Las Vegas March 21, starting at Town Square (6643 Las Vegas Blvd. South). With a 5K walk or run for kids and adults alike, there is something for every skill level to enjoy. You can register now or wait until the day of the event. Onsite registration on March 21 goes from 6:45-8 a.m. If you wait to register at the event, you will not receive an event t-shirt or timing chip for the run with your registration fee. However, you may receive a t-shirt with an additional donation of $15. If you have any registration questions, contact Ashley Schaus at ashleys@snv.wish.org. All other event questions can be answered by Heather Buzo at heatherb@snv.wish.org. The fun kicks off at 7:30 a.m. with Opening Ceremonies, which will include stories of Wish Moments, as well as recognition for the event’s sponsors. The 5K run kicks off at 8 a.m., followed shortly after with the 5K walk at 8:05. The run and walk are expected to conclude at 10 a.m. Whether you’re an adult, a kid, a runner or a walker, you can find a participation level that’s right for you. For adults ages 18 and up, register for the 5K run or the 5K walk for $30. Kids and teens ages 4 to 17 can register for the 5K run or walk for $20, and kids under age three can participate for free! Wish Kids can register at any level for free. 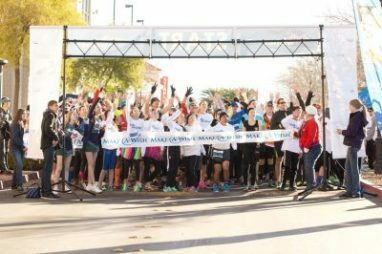 Walk For Wishes is all about supporting Wish Kids and funding more wishes for Make-A-Wish Southern Nevada, and there are many ways to do that! Consider creating or joining a FUNdraising team with your friends, family and coworkers to get even more people involved in the wish-granting magic. You can also support the walk by volunteering either as an individual, or by bringing your friends and coworkers along. Volunteer opportunities include preparing packets, setting up for the event, greeting and checking in participants, handing out refreshments and directing people on the walk route. If you would like to volunteer, contact Erin Calhoun at erinc@snv.wish.org for more information. Sponsoring the 2015 Walk For Wishes is another great way to show your support. Sponsorship levels include Race Partners ($2,500), Community Partners ($5,000), Wish Champions ($10,000), Mission Champions ($20,000) and Presenting Sponsors ($35,000). Check out the sponsorship packet for more information including the perks of being a sponsor. If you want to help Walk For Wishes but can’t attend, consider spreading the word to your friends, family and coworkers. You can also make a general donation to the event to show your support. Looking for other ways to support Make-A-Wish Southern Nevada? Consider a car donation to Wheels For Wishes. Our car donation program accepts most cars, trucks, boats, RVs and motorcycles, and auctions or recycles them to benefit Make-A-Wish Southern Nevada. Not only is your car donation a great way to help more wishes come true for kids in southern Nevada, it will also give you a great tax deduction as well as free pick-up or towing of your vehicle. To make a car donation to Wheels For Wishes, give us a call at 1-877-431-9474 or use our online car donation form. You’ll feel great knowing that something as easy as a car donation can help more children in your community have their wish come true!